This schematic shows the basic structure of an exciplex-based OLED with emission color and efficiency that can be controlled simply by changing the spacer thickness. Demonstrating a strategy that could form the basis for a new class of electronic devices with uniquely tunable properties, researchers at Kyushu University were able to widely vary the emission color and efficiency of organic light-emitting diodes based on exciplexes simply by changing the distance between key molecules in the devices by a few nanometers. This new way to control electrical properties by slightly changing the device thickness instead of the materials could lead to new kinds of organic electronic devices with switching behavior or light emission that reacts to external factors. Organic electronic devices such as OLEDs and organic solar cells use thin films of organic molecules for the electrically active materials, making flexible and low-cost devices possible. A key factor determining the properties of organic devices is the behavior of packets of electrical energy called excitons. An exciton consists of a negative electron attracted to a positive hole, which can be thought of as a missing electron. In OLEDs, the energy in these excitons is released as light when the electron loses energy and fills the vacancy of the hole. Varying the exciton energy, for example, will change the emission color. However, excitons are commonly localized on a single organic molecule and tightly bound with binding energies of about 0.5 eV. Thus, entirely new molecules must usually be designed and synthesized to obtain different properties from these Frenkel-type excitons, such as red, green, or blue emission for displays. 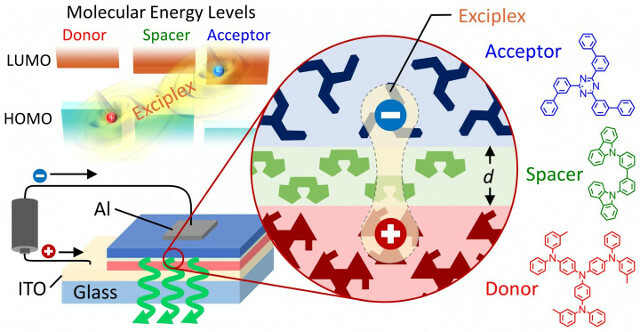 Researchers at Kyushu University's Center for Organic Photonics and Electronics Research (OPERA) instead focused on a different type of exciton called an exciplex, which is formed by a hole and electron located on two different molecules instead of the same molecule. By manipulating the molecular distance between the electron-donating molecule (donor) and the electron-accepting molecule (acceptor) that carry the exciplex's hole and electron, respectively, the researchers could modify the properties of these weakly bound excitons. "What we did is similar to placing sheets of paper between a magnet and a refrigerator," said Associate Professor Hajime Nakanotani, lead author of the paper reporting these results published online February 26, 2016, in the journal Science Advances. "By increasing the thickness of an extremely thin layer of organic molecules inserted as a spacer between the donor and acceptor, we could reduce the attraction between the hole and electron in the exciplex and thereby greatly influence the exciplex's energy, lifetime, and emission color and efficiency." Indeed, the changes can be large: by inserting a spacer layer with a thickness of only 5 nm between a donor layer and an acceptor layer in an OLED, the emission color shifted from orange to yellowish green and the light emission efficiency increased 700%. For this to work, the organic molecule used for the spacer layer must have an excitation energy higher than those of the donor and acceptor, but such materials are already widely available. While the molecular distance is currently determined by the thickness of the vacuum-deposited spacer layer, the researchers are now looking into other ways to control the distance. "This gives us a powerful way to greatly vary device properties without redesigning or changing any of the materials," said Professor Chihaya Adachi, director of OPERA. "In the future, we envision new types of exciton-based devices that respond to external forces like pressure to control the distance and electrical behavior." In addition, the researchers found that the exciplexes were still formed when the spacer was 10 nm thick, which is long on a molecular scale. "This is some of the first evidence that electrons and holes could still interact like this across such a long distance," commented Professor Adachi, "so this structure may also be a useful tool for studying and understanding the physics of excitons to design better OLEDs and organic solar cells in the future." "From both scientific and applications standpoints, we are excited to see where this new path for exciton engineering takes us and hope to establish a new category of exciton-based electronics." This research is ongoing under the Adachi Molecular Exciton Engineering Project funded by the Exploratory Research for Advanced Technology (ERATO) program of the Japan Science and Technology Agency (JST).